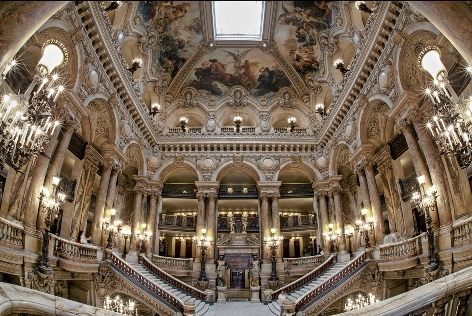 The Palais Garnier is an opera house by more than 2,000 seats, 2,054 for precise, built in the late nineteenth century, until 1989, when the new Bastille Opera opened its doors to the public, was the only house of the Opera de Paris, the oldest national dance company in the world. And so much is its charm, which although less capacious last arrived; Palais Garnier continues to be the preferred location for the performance of the renowned dance company. The Palais Garnier is probably the most famous opera house in the world, a symbol of Paris, such as the Notre Dame Cathedral, the Louvre, or the Basilica of the Sacred Heart. Also thanks to the famous novel The Phantom of the Opera, with all its cinematic interpretations and performances. Even if, on its architectural value, there is no unanimity of opinion; and so if someone is a pre masterpiece of the Second Empire, Le Corbusier, once compared to “decoration of a tomb”. The neo-classical facade, as well as recalling the ancient myths, celebrates the great masters of European classical music. Among others Beethoven, Mozart and Rossini. Opulent interiors, huge chandeliers, precious gilded stucco, lots of mirrors and large areas of marble, many details that catch the eye in all directions, and the work on the ceiling of the auditorium dedicated in 1964 by Chagall from the great masters of music. Also worth seeing if you are not a fan of opera or ballet. Open to visitors every day, from 10 to 16:30 (one hour more in summer), the entrance ticket costs €10, free under the age of 10.